A new show is hitting RT America's airwaves. ‘Watching the Hawks’ will give viewers a fresh perspective no matter what their political leanings are – from war hawks to isolationists – and, more importantly, every voice in between. The show ‒ hosted by Tyrel Ventura, Sean Stone and Tabetha Wallace ‒ will use balanced conversation and honest debate to focus on stories the rest of the media ignores. "Our take on events will not be your typical bland mainstream cable news coverage because the three of us are not your typical bland mainstream cable news hosts. We want to talk about issues and events that actually have a direct impact on the lives of our viewers,” said Ventura. “There are millions upon millions of Americans who do not feel their voice and the issues that they deem important are represented by Fox, CNN, or MSNBC, " he added. "'Watching the Hawks' is for the person who feels disenfranchised from the political process, distrustful of a media that seems to be pandering to anyone but them, disillusioned by the financial markets - but hopeful for the future," said RT editor-in-chief Margarita Simonyan. "The show is a great addition to our RT America line-up." 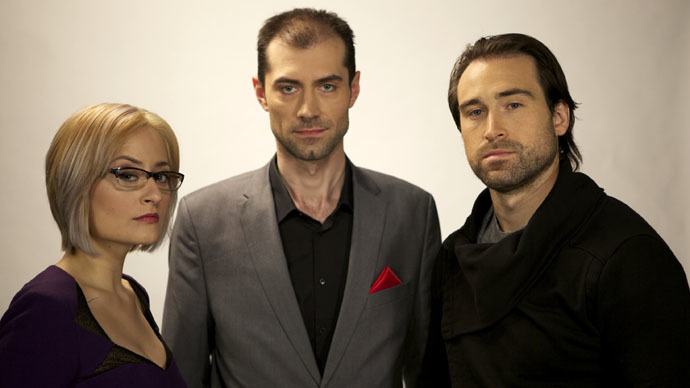 The three co-hosts of ‘Watching the Hawks’ previously created the online alternative news show 'Buzzsaw'. Their goal is to address subjects and issues that are either overlooked or intentionally avoided by the mainstream media, or are buried under the sheer volume of information slamming us on a daily basis. Ventura has guest-hosted several episodes of ‘Breaking the Set’. He brings a fun, self-effacing swagger to the proceedings while speaking from the heart without fear of speaking the truth to power. Stone contributes an academic perspective to ‘Watching the Hawks’, having spent time at both Princeton University and Oxford. Wallace’s passion for the rights of the common man, a strong belief in honesty and a tough Midwestern attitude will set her apart from the usual talking heads of mainstream media, according to RT.
" I consider myself a 'revolutionary since 1984'. It's a double-entendre, referring not only to the famous Orwellian year in which I was born, but to the book's predictions of a society so mentally enslaved that its people do not even know what freedom means," said Sean. "It is my belief that ideas are the true revolutionaries, and unless we are willing to confront new ideas, no matter how uncomfortable, then we are doomed to that same corporate-run state that directs us to look abroad for an enemy, rather than in the thrones of power that rule over us. To oppose this corporate empire that manipulates us like Big Brother, I will not only speak my truth to power, but I also hope to change the lens by which we view the world. Because a change in consciousness changes everything." The show will begin on March 23, airing four days a week out of RT America’s studios in Washington, DC.